A short but hugely enjoyable walk in Wharfedale visiting the limestone pastures of Malham Moor before returning via the permissive path through Threshfield Quarry. Whilst returning to Kilnsey towards the end of a fine walk on to Malham Moor back in February I spotted a footpath signposted for Threshfield Quarry. Checking my map there was no corresponding right of way shown. Intrigued I did a bit of googling when I got home and discovered that there was indeed a fairly new permissive path into and through the quarry. Thinking it would be an interesting place to visit I added it to my ‘to-do’ list for the year. So it was that a few months later I remembered Threshfield Quarry when I was planning a shortish walk with my wife and daughter. We started the walk from the start of the access road to the quarry just off Skirethorns Lane, a minor road heading west from Threshfield. The road junction is wide enough to park cars on either side of the access road. Rather than heading directly for the quarry I decided to leave it to the end of the walk and instead turned right on to Skirethorns Lane to walk past the tiny hamlet, the centre of which are two houses in front of an attractive little green. Continuing up on to Wood Lane we soon turned left on the driveway to Wood Nook Farm. Having walked up the drive and through the small caravan and campsite we crossed Rowley Beck, which was bone dry, to begin a gentle climb above the beck in an area which is a lot less wooded than the map shows. Towards the top of this section of path there were some nice retrospective views towards Grassington on the far side of the valley. After passing Height House and then Height Laithe we made our way to an old lime kiln where we stopped for a picnic. While we there Rhiannon and I went to explore the nearby Higher Heights Hole. A large grassy depression in the ground we found three separate cave entrances in the bottom of the hole. I also came across some Bitter Vetch, the first time I can remember coming across this particular flower. Rather than returning to the bridleway proper we took a track above the kiln which soon petered out as we crossed a limestone pasture to reach Malham Moor Lane. Turning right we soon reached the point where the bridleway crosses the road. Turning left on this we reached a brow where there was grand view up dale towards the heights of Great Whernside and Buckden Pike. After dropping down from the brow we reached a gate in the wall. Passing through this we arrived at the signpost I’d come across back in February. Turning right we followed a thin path over the brow of another hill, descended past some limestone pavement and reached the entrance to the quarry. At this point there were two signposted options, one to walk around the top edge of the quarry or a path signposted for the quarry floor. Taking the latter option we walked down a broad track passing below the steep quarried walls to find ourselves on the huge flat floor of the quarry. Threshfield Quarry was active from 1902 until it finally closed down in 2001. After the limestone pastures above it was like entering another world entirely. While from a distance quarries can be ugly scars on the landscape Threshfield Quarry is well hidden and I found the walk through it a fascinating experience, especially impressive was the gorge like section towards the end of the upper quarry. At the end of this the track descended past what I assumed were some earlier quarries which are again largely hidden from external view. Eventually, after passing the middle and lower quarries, we gained the wide access road which within a few minutes brought us back to the car. All in all this was an excellent walk with a fine contrast in scenery between the first section of the walk and the quarry. I was also delighted with the variety of wildflowers we saw. In addition to the bitter vetch in Higher Heights Hole we also saw, amongst others, bluebells, primrose and yellow poppies in the woods, flowering wild strawberries above Rowley Beck and scattered dog violets on the hill above the quarry. 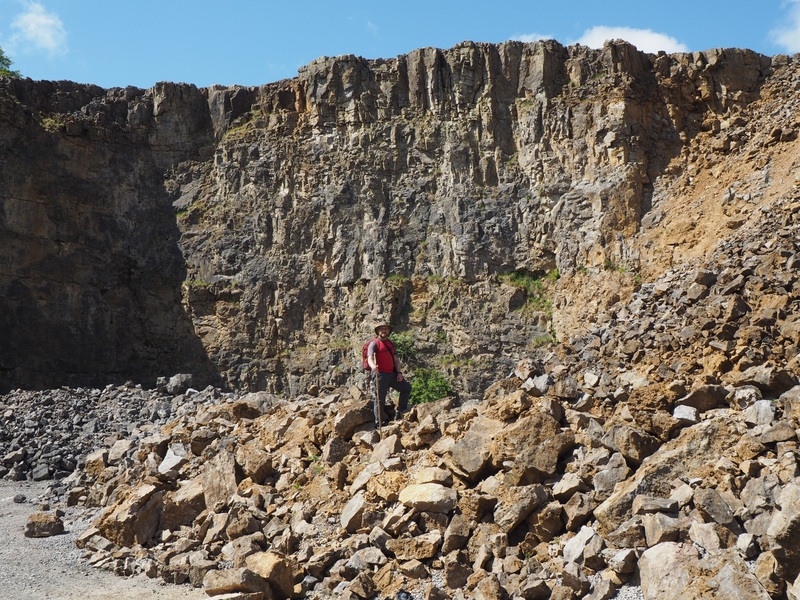 I’ll certainly be going back to visit the quarry again and it is worth noting that the path around the top of the quarry could easily be utilised to create a shorter circular walk.